Synthesis of seven odorant Schiff bases of methylanthranilate, an aroma constituent of blossom essential oils, with naturally occurring carbonyl compounds (citral, citronellal, cuminaldehyde, vanillin, veratraldehyde, acetophenone and α-ionone) employing conventional and microwave irradiation methods was carried out. Elemental and spectral (FT-IR, 1H NMR and 13C NMR) analysis of these compounds supported their structures. These Schiff bases had olfactory attributes suitable for various fragrance compositions. 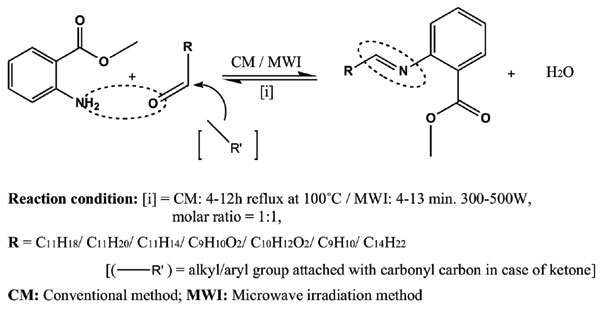 Microwave irradiation method was efficient in terms of reduced reaction time, solvent use, and increased yields of these compounds without affecting their olfactory characteristics. These compounds also displayed varied antimicrobial activity against Aspergillus niger, Penicillium chrysogenum, Staphylococcus aureus and Escherichia coli. Antimicrobial activity, carbonyl compounds, methylanthranilate, microwave irradiation, olfactory property, Schiff base.